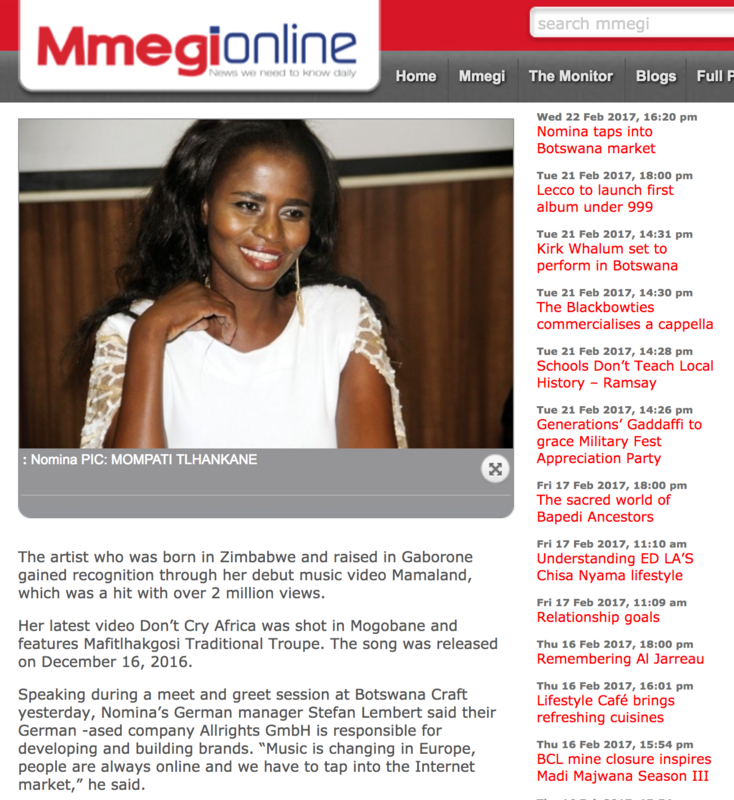 The artist who was born in Zimbabwe and raised in Gaborone gained recognition through her debut music video Mamaland, which was a hit with over 2 million views. Her latest video Don’t Cry Africa was shot in Mogobane and features Mafitlhakgosi Traditional Troupe. The song was released on December 16, 2016. Speaking during a meet and greet session at Botswana Craft yesterday, Nomina’s German manager Stefan Lembert said their German -ased company Allrights GmbH is responsible for developing and building brands. “Music is changing in Europe, people are always online and we have to tap into the Internet market,” he said. He said Nomina is an example of how easy it is to reach people with her beautiful voice. “Its just a beginning, this project is eight months old. We want Batswana to join in with us,” he said. The manager of Nomina in Botswana Zenzele Hirschfeld said Africa needs to unify and affiliate. “We have to tap into other markets. We need to make use of our culture and embrace Botswana,” she said. Hirschfeld said Nomina has showed everyone the impact social media has. For her part, Nomina said Botswana is her home even though she is based in Germany. “I have managed to reach Batswana from far, and now I have come here physically to show brand,” she highlighted. Nomina said her song advocates for unity amongst African nations for Africa is one. Real name Pamela Nothando Bhulu, Nomina’s musical spectrum is a mix of R&B, Pop and Reggae combined with African sounds and Spanish elements. With German-Indonesian producer, Orchidan Waworka, they created a symbiosis of dynamic soul singing, melodic pop and R&B combined with lively African percussions, classical and contemporary electronic dance music. Through her music, Nomina aims to encourage people to fight the injustice and corruption plaguing the African continent. Nomina is currently working on her debut album Ednah Sunrise that will feature the acoustic version of Don’t Cry Africa.